Senator James G. Blaine, the leader of the Half-Breeds. The "Half-Breeds" were a political faction of the United States Republican Party in the late 19th century. The Half-Breeds were a moderate group, and were the opponents of the Stalwarts, the other main faction of the Republican Party. The main issue that divided the Stalwarts and the Half-Breeds was political patronage. 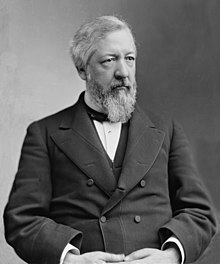 The Stalwarts were in favor of political machines and spoils system-style patronage, while the Half-Breeds, led by Maine senator James G. Blaine, were in favor of civil service reform and a merit system. The epithet "Half-Breed" was invented in derision by the Stalwarts to denote those whom they perceived as being only half Republican. In the 1880 Republican National Convention, the Stalwart candidate, former president Ulysses S. Grant, was pitted against Half-Breed James G. Blaine for the party nomination. Grant's campaign was led by Stalwart leader Roscoe Conkling of New York, the state with the biggest split between Stalwarts and Half-Breeds. Despite Conkling's attempts at imposing a unit-rule in the Republican National Convention by which a state's votes would be grouped together for only one candidate, a number of Stalwarts went against him by vocalizing their support for the Half-Breed Blaine. The Half-Breeds united to defeat the unit-rule in a vote, and elected Half-Breed George Frisbie Hoar to the position as temporary chairman of the convention. Both sides knew there was no chance of victory for either candidate, and the Half-Breeds chose James Garfield as a compromise candidate. Garfield won the party's nomination on the thirty-sixth ballot, and won the 1880 presidential election. Blaine was chosen as Garfield's Secretary of State, and carried heavy influence over the political appointments Garfield issued for congressional approval. After Garfield was assassinated by Charles J. Guiteau, a Stalwart, who proclaimed, "I am a Stalwart of the Stalwarts and Arthur will be President", the new Stalwart president Chester A. Arthur surprised those in his own faction by promoting civil service reform and issuing government jobs based on a merit system. The Half-Breeds put through Congress the Pendleton Civil Service Reform Act (authored by Democrat George H. Pendleton), and Arthur signed the bill into law on January 16, 1883. The act put an end to the spoils system, at least symbolically, placing a significant number of federal employees under the merit system and putting the government on the road to true reform. The act also set up the United States Civil Service Commission, banished political tests, denied jobs to alcoholics and created competitive measures for some federal positions. The Half-Breed and Stalwart factions both dissociated towards the end of the 1880s. ^ Gilman, D. C.; Peck, H. T.; Colby, F. M., eds. (1905). "Half-Breeds" . New International Encyclopedia (1st ed.). New York: Dodd, Mead. ^ Ackerman, Kenneth D. (2003). Dark Horse: The Surprise Election and Political Murder of President James A. Garfield. New York: Carroll & Graf Publishers. p. 24. ISBN 0-7867-1151-5. ^ Hernon, Joseph Martin (1997). Profiles in Character: Hubris and Heroism in the U.S. Senate, 1789–1990. New York: M. E. Sharpe, Inc. p. 108. ISBN 1-56324-937-5. ^ Hoar was later appointed as permanent chairman of the convention. ^ Ackerman (2003), p. 221. ^ Ackerman (2003), p. 384. ^ Sauer, Patrick (2000). The Complete Idiot's Guide to the American Presidents. Indianapolis, Indiana: Alpha Books. p. 290. ISBN 0-02-863821-2. ^ Sauer (2000), p. 291. Welch, Richard E. George Frisbie Hoar and the half-breed Republicans (Harvard UP, 1971). This page was last edited on 31 October 2018, at 21:08 (UTC).